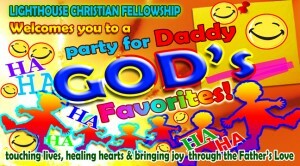 The Church is extending its heart and hands to God’s special creation, the children, through one of its Mercy Ministries called Party for Daddy God’s Favorites. Its goal is to reach out the underprivileged children of Davao City, most of whom have few experiences of special parties for kids. Party for Daddy God’s Favorites aims to paint a smile and inject a dose of joy to every child as they are treated for a one-of-a-kind party experience. It intends to communicate the love of God and eliminate an orphan spirit through a simple but meaningful party. Genuine worship, entertaining dance presentations, performances from a clown, informative Bible story play, delicious food, and great fellowship equates a heavenly celebration for God’s beloved, the children. …Truly I tell you, whatever you did for one of the least of these brothers and sisters of mine, you did for me.